Acknowledged as the foremost of Sri Ramakrishna's many notable disciples, both lay and monastic, Swami Vivekananda was an illumined being of the highest order. As the forerunner who brought the spiritual teachings of India to the West in 1893 at the convening of the Parliament of Religions in Chicago, he has greatly influenced the last hundred years of spiritual growth in Europe and America. We offer everlasting tribute to Swami Vivekananda, who is Shiva incarnate, the radiant sun of knowledge reverently adored by celestial and earthly beings. With a glance filled with compassion, He shatters the confusing morass of negativity while conferring the sought after boons of fulfillment and liberation. To Vivekananda, the Supreme Teacher, adorned with the new moon as his emblem and worshiped by all beings, to the One, we pay homage. 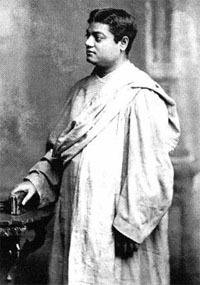 Born in Calcutta in 1863, he passed into mahasamadhi (final absorption into Absolute Reality) just 39 years later. Like Shankara, who lived a very short physical life but who regenerated India and added considerably to the world's spiritual wealth, Swami Vivekananda possessed an illumined intellect, a vast and retentive memory, a heart devoted to God that was full of compassion for his fellow human beings and an ever-present realization of his true nature, whether working, worshiping or meditating. As a monk, he gave the word and the station a new meaning. Not content to retire from the world and blissfully contemplate his own inner realization, he founded a religious order based upon service to mankind without compromising the highest ideals of spiritual life. The motto he chose for the Ramakrishna Order "atmano mokshartha jagad dhitaya cha" states this well: "For the realization of the Self and the benefit of the world." In addition to the humanistic element in his work, the swami broke through many other types of antiquated taboos concerning outmoded traditional values. Being the first to leave India in order to teach the timeless message of Vedanta to the rest of the world, Vivekananda broke with the tradition and lost his caste as a result. Criticized for this and for teaching the Vedic wisdom to foreigners, the swami explained that the lover of God has no caste restrictions that the devotees of the Lord form their own caste. By this fearless action and in many other ways, Vivekananda destroyed old conventions and concepts, opening the way for spiritual teachers from the east to come westward. "...granted that you attain personal liberation by means of the realization of the Advaita, but what matters it to the world? You must liberate the whole universe before you leave this body. Then only you will be established in the eternal Truth. Has that bliss any match...? "You will be established in the bliss of the Infinite, which is limitless like the skies. You will be struck dumb to find your presence everywhere in the world of soul and matter! You will feel the whole sentient and insentient world as your own self. Then you cannot help treating all with the same kindness as you show towards yourself. This is indeed practical Vedanta." — Talks with Swami Vivekananda, pp. 203-204. Swami Vivekananda was not a retiring or reticent figure. Neither was he an austere or aloof monk with a superior attitude or a spiritual ego. His down-to-earth policies of beneficial action coupled with an unsurpassed knowledge of the scriptures place him in a league all his own. Yet, he was not content to work slavishly in an imperfect world, only to advocate profound philosophy to secular and materialistic societies. His was a plan that incorporated selfless service to suffering millions with the living realization of God both within the world and beyond it as well. The eternal religious principles he espoused were, to him, directly realizable in everyday life, and not content to merely point them out, he fashioned new and refreshing avenues of spiritual expression for them. This resurrection of the timeless truths of Vedanta, spoken of now as neo-Vedanta by his friends and disciples, was given by Swami Vivekananda from the non-dual standpoint. The Advaitic aspect of Vedanta was very dear to him and he saw in it the solution for all the problems of relative existence. This did not diminish his love for and his devotion to the Divine Mother Reality that was essential to Sri Ramakrishna's new dispensation. About Mother Kali, Sri Ramakrishna's Chosen Deity, Swami Vivekananda said, "You do not understand, She is my especial Ideal." Where seekest thou? That freedom, friend, this world nor that can give. In books and temples vain thy search. Thine only is the hand that holds the rope that drags thee on. Then cease lament, let go thy hold, Sannyasin bold! Say — "Om, Tat Sat, Om!" The Swami's mission in the West is well-documented. Making contact with thousands of people via lectures, discourses, classes on Yoga and philosophy, informal meetings and personal interviews, he was a man that combined the fine art of mature detachment with a refined appreciation for the divinity present in human beings and in all things. Like his poems, the books that were published in his name are exceptional, for he seldom wrote, preferring to transmit his message in person. Adept stenographers, however, always seemed to be present and they took down his words verbatim, leaving the world a wonderful treasury of "living books" which come straight from the source. "I will be born a thousand times and bear a thousand miseries if I can but help one suffering being to gain liberation." "I will come back again and again until all the beings of the world know that they are one with Brahman."